Few family fun activities have stood the test of time like bowling. It’s a great choice when the weather turns cold, rainy or hot. It’s also a fun activity for almost every age. I’ve bowled with toddlers and teenagers (often at the same time!) My family bowls about 4 times a year and my husband will say “I don’t know if I should go. I’m so bad at bowling.” And I always reply, “Babe, almost everyone is bad at bowling. That’s what makes it fun.” So don’t let your lack of skills stand in your way! Nashville and Middle Tennessee are home to lots of bowling centers. Many of these locations also include arcades and family fun centers. 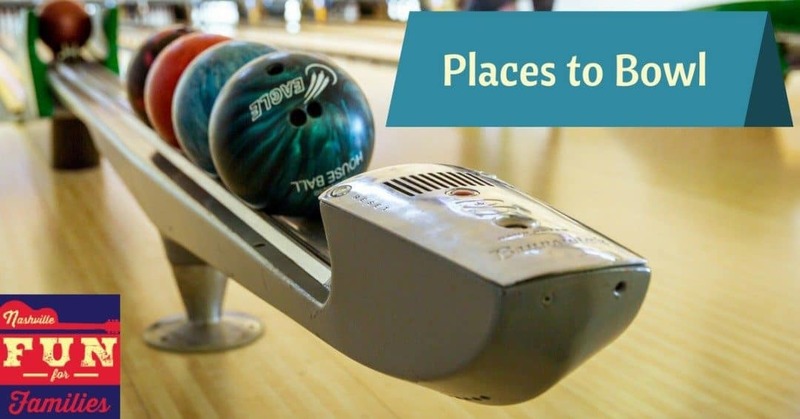 Use this list to plan some indoor fun at a local bowling alley. Pick one in your neighborhood or venture out a bit and try some place you’ve never been. Hermitage Strike & Spare (Map) features 32 bowling lanes and 32″ HD scoring monitors. Hours, cost and specials at this link. This center also has a “Fun Zone” that includes an arcade, bumper cars, GyroXTREME and more. Hours and rates for the Fun Zone at this link. Donelson Bowl (Map) has been open since 1956! There are 24 bowling lanes and small arcade. Prices and daily specials at this link. Call (615) 883-3313 for hours. Dave & Buster’s (Map) features 12 bowling lanes with multimedia shows, a video wall and black light bowling. Games are half price on Wednesday. Dave & Buster’s also has a full gameroom/arcade, restaurant, billiards and more. Donelson Plaza Strike & Spare (Map) features 24 bowling lanes. Hours, cost and specials at this link. Tusculum Strike & Spare (Map) features 24 bowling lanes. Hours, cost and specials at this link. Pinewood Social (Map) features 6 reclaimed wood lanes. Cost is $40 an hour and includes shoe rental for up to 6 people. This location also includes a restaurant, bocce ball court, dip pools and more. Call 615-751-8111 for information. Murfreesboro Strike & Spare (Map) features 36 bowling lanes. Hours, cost and specials at this link. Lanes, Trains, & Automobiles (Map) features 32 bowling lanes with vector scoring. Hours and pricing at this link. The center also has bumper cars, laser tag, and an arcade. Smyrna Bowling Center (Map) features 52 bowling lanes. They are open 24hrs a day/7 days a week /365 days a year. Pricing at this link. Stars and Strikes (Map) features bowling, arcade, laser tag and more. Open 10AM to midnight. Reserve your lane in advance at this link. Holder Family Fun Center in Hendersonville (Map) features 28 bowling lanes. They are open 24hrs a day/7 days a week /365 days a year. Prices and specials at this link. This center also has laser tag, indoor go-karts, indoor mini golf, rock climbing, bumper cars, body bubbles. soft play area, roller skating and more. Hendersonville Strike & Spare (Map) features 24 traditional bowling lanes, 12 VIP lanes and 42″ LCD monitors. Hours, cost and specials at this link. This center is also home to Circus World. This area includes bumper cars, laser tag, roller skating, an arcade, a soft play area, and more. Hours and rates for Circus World at this link. Holder Family Fun Center in Gallatin (Map) features 28 bowling lanes. Hours and rates at this link. This center also has laser tag. King’s Bowl (Map) features 16 bowling lanes. Hours and pricing at this link. King’s Bowl also has billiards, air hockey, foosball and shuffleboard. Franklin Family Entertainment Center (Map) features 24 regular bowling lanes and 6 mini lanes. Hours and prices at this link. Pro Bowl West (Map) features 16 bowling lanes. Prices at this link. Hours of operation at this link.